Dr. Negola began his undergraduate studies at the University of Maryland and completed them as well as graduate studies in Veterinary Medicine at Tuskegee University School of Veterinary Medicine in Tuskegee, Alabama, in 1972. 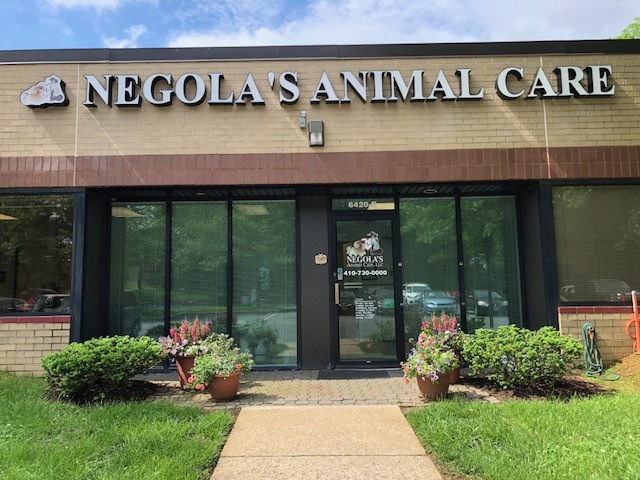 After a brief period at Norbeck Animal Hospital, Dr. Negola opened his own practice on South Stonestreet Avenue in Rockville. In 1980 the hospital moved to East Gude Drive and received the “Hospital of the Year” award from Veterinary Economics Magazine for excellence in architecture and design. The hospital was also accredited with the American Animal Hospital Association (AAHA). The year 2002 brought Dr. Negola to his free-standing hospital located on Fields Road in Gaithersburg. In 2016 Dr. Negola sold this practice. In April of 2017 Dr. Negola opened a practice in Columbia, MD. Dr. Negola’s additional veterinary awards and degrees include an advanced orthopedic course completed at Ohio State University in 1980 and “50-Plus Hour Per Year Awards” from the D.C. Academy of Veterinary Medicine for Continuing Education presented to him continually beginning in 1974. In 1984, Dr. Negola became a Diplomate of the American Board of Veterinary Practitioners, specializing in canine and feline medicine. This specialty requires maintenance of certification every 10 years, and Dr. Negola successfully completed his in 1994, 2004, and again in 2014. Dr. Negola is also a former president of the Montgomery County Veterinary Medical Association. In 1988, he was named “Alumni of the Year” at Tuskegee University. In the July, 1989 issue of Washingtonian Magazine, readers chose Dr. Negola as the BEST VETERINARIAN IN THE SUBURBAN WASHINGTON AREA. Dr. Negola returned to Ohio State in 1994 to attend a course on Complete Hip Replacement and is now certified to perform this procedure at this hospital. His outside interests include a variety of sports—tennis, racquetball, skiing, boating, biking, jogging, horseback riding, and scuba diving. His wife and business partner, JoAnne, shares some of his sports interests but above all enjoys their three Birman cats. Dr. Negola and JoAnne have two grown sons, Todd and Sean, both of whom are psychologists and work for the Veterans Administration. Todd and his wife have given the Negolas two grandsons and one granddaughter. Sean and his wife have given Dr. Negola one young granddaughter. The Negolas make their home in upper Montgomery County with a barnyard full of animals—llamas, alpacas, mini donkeys, emus, geese, goats, ducks, swans and koi. They also have a Dalmatian, Cookie, and a Poodle, Sassy. Needless to say, their business as well as their abundance of pets keeps Dr. Negola and JoAnne busy and on the go!